Learning how to make deodorant is a great first step on the way to making more of your own body products at home. It’s not complicated, much better for you and is also very effective. This simple recipe is a great one to start with! A few years ago I was diagnosed with some autoimmune issues. Instead of opting for medications at that time, I took it upon myself to research my condition and see what I could do to improve some areas of my health and life that seemed to be problematic for me. The first big area to conquer was nutrition. Of course, this is a big one when you’re having to learn and re-learn what you thought was healthy. But it’s especially trying when you’re responsible for feeding a family at the same time. Nevertheless, this was my big area of focus: healing foods and nutrition. My focus on nutrition and healthy food will of course continue, but I knew I needed to move onto other areas that need cleaning up as well. So I started to look beyond what we put into our bodies (food) and look also at what we put on our bodies. Our skin is our largest organ, after all, and it’s incredibly absorbent, sucking up whatever we put onto it through our pores and sending it directly to our bloodstream. So it makes sense that we should all be more mindful of what we’re putting on our skin and what we’re coming into contact with. That’s why I decided to start making my own homemade home and body products too. First of all…..YES, they do take extra time and thought (and sometimes even extra money). But in the long run, the health benefits far outweigh any additional time spent making them, and overall you will save much more money making your own than buying them at the store. One of the first areas that I wanted to address was my deodorant. This is something pretty much everyone needs and uses on a daily basis, and yet there are all sorts of questionable and even dangerous ingredients in most store-bought deodorants; Ingredients like aluminum, paragons, triclosan and other harmful chemicals that you probably don’t want touching your skin. So if you’re ready to dive in and start making your own all-natural homemade body products, let’s get started with this homemade deodorant! Step One: Place coconut oil, shea butter, and beeswax pastilles in a glass measuring cup. You can melt these in the microwave or I use a toaster oven (since I don’t have a microwave). 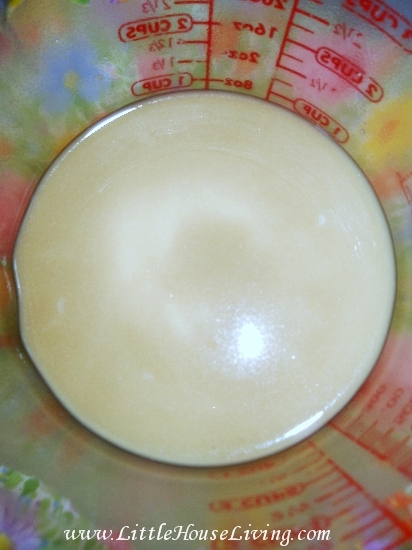 Step Two: Once melted, add in bentonite clay, baking soda, arrowroot powder, and essential oil drops. Step Three: Mix together until smooth. Step Four: Pour into containers of your choice. You can purchase empty deodorant containers here or tins at the Bulk Herb Store or just use any container that you already have. I like deodorant containers, personally. But the tins or any other container can be used, applying it on with your fingertips. I’ve been using this deodorant for several years now and I’m very happy with it. It seems “dry,” but as soon as you start rolling it under your arms, it’s perfect. It glides on very smooth and nice. The smell is nice, very neutral, with the essential oil mix that I used. I was afraid that it would make a spot on my clothes that appeared “greasy”, since I had talked to a friend who had tried another recipe and was disappointed that it left a spot on her clothes. This formulation has never left any marks on my clothes. I’ve been very happy with it and will continue to use it as a great alternative to store bought deodorants. If you feel like the deodorant is irritating your skin, replace all of the baking soda with arrowroot powder for a more sensitive skin formula. I hope that you’ll try it too and I’d love to know what you think! Looking for more fun DIY projects that you can make quickly and easily? 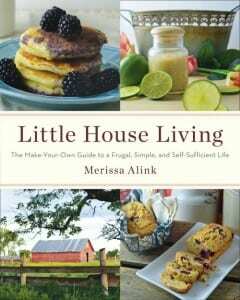 Little House Living: The Make Your Own Guide to a Frugal, Simple, and Self Sufficient Life has over 130 recipes just like this one! 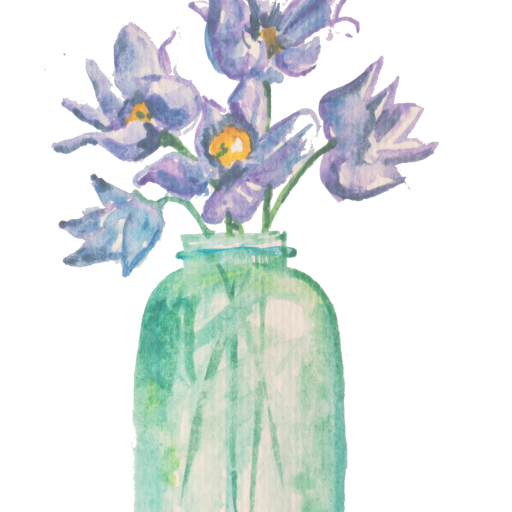 This blog post about How to Make Homemade Deodorant was originally published on Little House Living in March 2014. It has been updated as of March 2019. Julie, I know you like the feel and the smell of it, and that it does not stain, but how does it work? I live 10 minutes from a Whole Foods and have tried many deodorants on their shelves. I have not been happy with the effectiveness of any of them, although they do smell good, etc. What makes a natural deodorant effective? I would love to know. Oh! Thanks for the recipe. I’m adding this to my list to try after I use up my current natural deodorant that isn’t working quite as well as I’d like. Teresa, for me, yes, the deodorant is working good. I am a avid walker and have been using it, and have been very pleased with the effectiveness of it. However, each person is different and sweats/smells differently. Our climate is cold in the winter, so I have not been able to test it on hot days. We can update the article on that effectiveness when we finally break from our winter/spring cycle and get into much warmer weather. We, too, have also tried many natural type products. I have been much happier with this particular blend of deodorant and for now, plan on continuing making and using it. As I am trying to make and use much healthier products, I have to look at the overall product of not using harsh chemicals and cost, overall. I am pleased with this one! I have also tried a couple of different deodorants from Whole Foods and they smell good in the package but after a couple of hours I can smell myself. I’m desperate to find a good deodorant that is natural but will keep me from being self conscience about it. Is this also effective as an antiperspirant? Thanks! No, like most natural deodorants this will only work as a deodorant. The aluminum in regular deodorants is how they become antiperspirants unfortunately. Do you have any suggestions on an essential oil to use in place of the OnGuard blend? I have some tea tree and a couple other single ingredient ones like orange, lavender, peppermint, eucalyptus and Lemongrass. Thank you for the post! Lavender or Tea Tree oil would work. You can blend what you have to create a scent you love. I have made similar recipes for deodorant without any essential oils at all. Hi. My name is karin and like you was diagnosed with an auto immune disorder. However I also stay away from nuts and their oils and citrus fruits bc of migraines. Any suggestions of what I can use instead of coconut oil and the essential oil thst has orange in it. Thanks so much I’ve read a lot about the benefits of all natural shampoo and lotions and adding deodorant will help even more. Babassu oil may work – or you can use any of the butters/oils that are solid at room temp (mango butter, double up the shea butter, etc)…but that’s just my guess. Perhaps Merissa or Julie have other suggestions? I much prefer homemade deodorant! do you find yours “stains” your clothing? My mom has not had issues with stains on clothing with this particular recipe. I love this recipe, my daughter was not amused when I told her coconut oil was good for deodorant. Coconut oil is good for everything! My ONLY change for the recipe would be to used the white beeswax pastilles. I had regular, organic (yellow) that I’ve used in other recipes and it stains my white clothing yellow (which isn’t really an issue because my homemade laundry detergent gets it out just fine)…but I purchased the white beeswax for my deodorant….just an idea. Thanks for a great blog!!! Thank you for this, deodorant was next on my list of things to make. 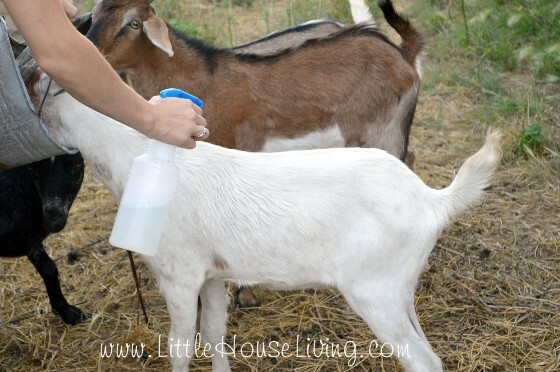 I have been using homemade cleaning products for over a year now and find them quite easy to make and very inexpensive as well as very effective. I make all of it, dish-washing liquid, laundry soap, household cleaners, glass cleaners, furniture polish, wood floor cleaner, etc. Start your ingredient kit with vinegar, Castile soap, borax, washing soda, baking soda, lemon juice, boiled linseed oil, and you have most everything you need! Is this as effective without the clay? I would try it without the clay, but I would increase the arrowroot and baking soda, with the same measurements as the clay, so your deodorant won’t be too soft and runny. Let me know how that turns out. Also, the above comment using the white beeswax was a good one. I rarely wear white, so didn’t think about it…but it was a good point. Thanks for all the suggestions. to make this deodorant without the clay should the measurements of arrowroot and baking soda be 4T or 3T each? Sorry, english is not my first language so I got a bit confused. You would use a total of 3 tablespoons of arrowroot and 3 tablespoons of baking soda instead of the clay. Wonderful, and I will give this a try!! I have just started using my own essential oils for body and cleaning products, so I can’t wait to see what scents my daughters and I come up with! I hope this works for our family, because deodorant is expensive!! I don’t think my hubby will get on board for this, but my girls will! Thanks!! mine came out such a dark grey. It’s still not solid, but am I on the right track? I have everything except the shea butter…would it work well without it? Shea butter will help it keep its shape a little better, otherwise it’s more likely to melt when it gets warm. I got the shea butter today. I just made it and mine looks really gray…it doesn’t look as clear, yellowish as the pictures. I measured everything like it says. Will it lighten as it dries? It may be grayer and it will lighten up a bit as it dries, the color does not effect the effectiveness. If you are looking for a slightly more expensive, but very reliable option – Lavilin would be my suggestion. You can buy the product on Amazon or directly on their website. I also recently saw them in Whole Foods. It is considered the best all-natural product that destroys underarm odors. Been using it for decades, no complaints at all! I have NEVER found a natural deodorant that worked for me (health food store or homemade) until I made a deodorant similar to this one, minus the clay, last winter/spring. I wanted to use it through the summer before posting it on my blog, just in case it did not work so great. Well, it DID work great … now I need to get that post done! The only problem I had – we have hot summers and no a/c most the time. My deodorant melted even with the beeswax and shea butter. Thankfully it stayed in the container. An easy remedy would be to store in the fridge, however it was easy enough to use it melted. I know this may be a silly question… But is it teaspoon or tablespoon for the clay? I have seen where tsp is lowercase and tbsp uppercase, but didn’t want to ruin a recipe assuming. Help? It’s 2 tablespoons of bentonite clay. I am excited to try this. I am going to add cypress essential oil because it is supposed to prevent excess sweating! Will let you guys know how it works! I saw on the picture that there were 2 sticks and a tin of deodorant. Am I to assume that this recipe makes about 3 sticks? I just want to make sure I have enough supplies on hand before I attempt this. Thanks so much for all of your ever-so-helpful tips and recipes! Yes, this recipe makes about 3 sticks. HI! This recipe looks great! I have some French Green Clay instead of the Bentonite, I’m wondering if I would get the same results aside from the color change. The green stuff is very dark. I’m going to give it a try and see. Also, regarding this recipe being antiperspirant – it actually would act as a natural antiperspirant! I know the baking soda and Arrowroot do already, and I’m guessing the clay would as well. It just doesn’t last as long as chemical antiperspirant, you have to reapply throughout the day to stay dry – but coming from a total Sweaty Betty over hear (lol, sorry if TMI), baking soda and arrowroot work BETTER than chemical antiperspirant! I’m not sure about the French Green Clay but I’d love to know how it goes if you try it! Can you tell me how many this makes? 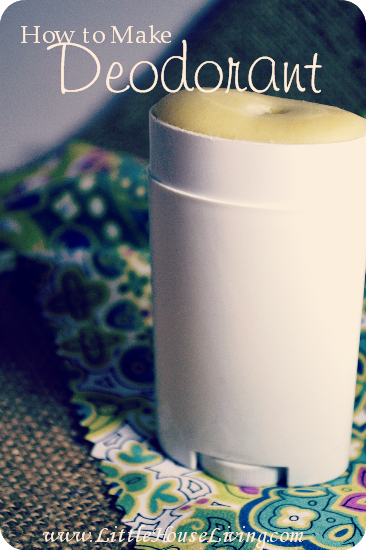 This recipe will fill 2 deodorant containers plus have a little leftover. I made this deodorant to get away from all the “bad stuff” in name brand deodorants and this is WAY BETTER than those!!! It not only is a great deodorant but it has worked really well as an antipersperant as well! I used purification as my oil and it smells wonderful. I’ve shared your reciped with many people, I love it so much! Thank you! Awesome, I’m so glad it worked for you! I’ve been making my own deodorant for a while now and I just use coconut oil, baking soda, and cornstarch. It works great. Yes you can! I just wash them out with soap and water and re-use. 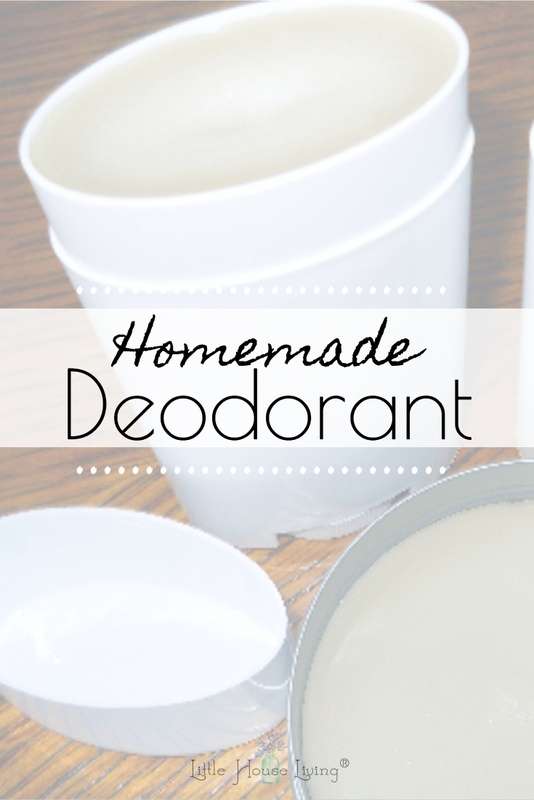 Trying this recipe for my first homemade deodorant! After pouring the ingredients into the stick containers, how long do I need to wait for it to be done/ready?? I would wait several hours (at least 4 to 6) or you could stick them in the fridge to make them harden faster. Julie, I’ve been trying to make this in New Zealand but can’t get it smooth. The baking soda remains gritty. Got any ideas on how to make it smooth? How about you post some actual measurements instead of these horrible volumetric US customary units. What is 1/4 cup of beeswax for instance? Beeswax is way too hard to measure into a cup and if you melt it first you’ll almost certainly end up throwing a bunch away because you can’t know how much 1/4 cup is before measuring it. 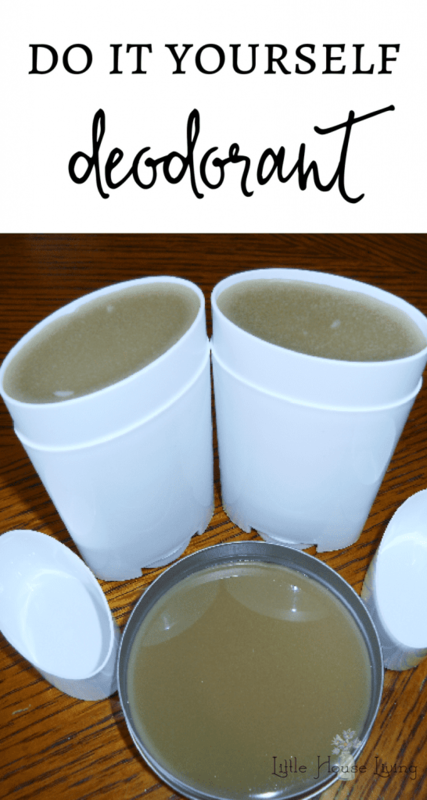 Soft coconut oil is also really hard to measure into a cup since it can be hard to pack down and if its soft or just hard to measure at all if its hard. This is really a problem with all these “homemade natural recipes”. They all use horrible volumetics instead of just listing weights (or at least parts..) and thus end up with tons of people complaining because their products turned out wrong. It cost $8 for a decent scale. Buy one and re-list the proper measurements. I love this deodorant, it is working so good to get rid of the smell! But the only problem I found with it (and it happened to my sister too) is that it stain all my synthetic clothing, especially the ones that are pink or purple. It look like an oil stain. I use organic bees wax, had a little bit of vodka to my essential oil mix to fix it and let it last longer and add 4 times the amount of essential oils you are using. Do you have an idea of what it can be that make it stain my clothes ? I have not tried it so I’m not sure on the exact amount but I’veheardthat some have replaced the baking soda with arrowroot powder.